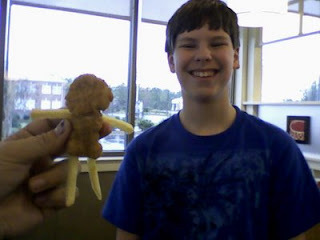 Ok, so I'm eating at Wendy's, before going to see a movie with the family and then onto my 3rd child's birthday trip with dad (we're going to the Foley outlet mall and then to Lambert's to eat), when out of the chicken nugget box pops chicken boy! Ok, maybe I added the arms and legs of fries, but the body and head were already intact from the box. Amazing (my friend Dean will love the ineffectual use of that word) the things I find at fast food places!